Mixed-media designer-artist, Dianne Sims, is Fire Mountain Gems and Beads' gold-medal winner in the 2008 and silver-medal winner in the 2009 Art Clay and Metal category. 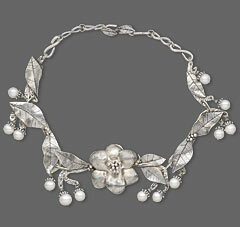 The 2008 award-winning necklace named Spring Blossom was inspired by the annual explosion of wild spring flowers along the shores of Lake Erie in northeast Ohio. Living near nationally protected marsh close to the shores of Lake Erie gives her the opportunity to experience the amazing eco-system that thrives in the marsh including thousands of budding flowers and trees along with a vast variety of marsh grasses. Dianne also diligently walks the many beaches along Lake Erie in search of "eco-trash" (metal, polished glass, ceramic pieces and wire) which have washed ashore. 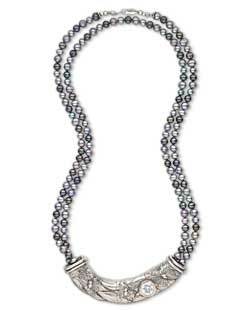 She has frequently incorporated the "eco-trash" into her jewelry to the amazement of her friends and peers. These are truly one-of-a-kind creations. However, as multi-talented as Dianne has remained, silver Art Clay has become her medium of choice. Her boundaries are only limited by her imagination, and her imagination is limitless. Dianne was born and raised in northeast Ohio. Her mother was always the artistic person and her older brother showed signs of greatness in his oil and water paintings throughout his career as an accomplished dentist. Dianne first chose to enter the medical field as a Registered Nurse. She also received a degree as a Registered Rehabilitation Nurse. Her forty-year career included being Director of Nursing in nursing homes and running a rehab company supplying teams of therapists to assist patients in nursing homes. She dedicated her career to helping the geriatric population. During the last eight years before retiring in 2007, she began her artistic endeavor. She is now a precious metal clay certified instructor, pursuing her love for art by teaching and sharing this inspiration with others. View all of Dianne's designs in the Gallery of Designs.